We see two ways to pick up trash - happily taking care of Mother Nature or angrily being dumped on by litter bugs. We choose happiness and so do many others. For example at a sustainability conference a local university president who owns a beach house on Dauphin Island talked about walking the beach with his wife, picking up trash and how the people who passed them would say thank you. And when they walked the beach the next day some of these people had their own bags and were picking up trash! given a chance to join a cleanup enough people will pick up trash to make a difference for future generations. What's in Your Cleanup Bag? The 2019 Cleanup Challenge begins January 1st! The top three teams in each of the two categories will earn beautification funds to be used for cleaning, improving and beautifying public right-of-way areas selected by your team! In order to participate in the challenge, each established team must complete this form and return it to district2web@mobile-county.net by the end of each month. Teams may join the challenge at any time before the May 31 deadline. Download the form for more information. We're asking folks to send us photos and videos of their great work and will feature those videos here on the website and on the YouTube channel. 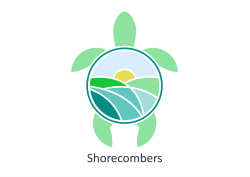 You can use the DropBox Link here to upload the large files and email us at-shorecombers@bellsouth.net. Establish a Love Your Community Team! Commissioner Connie Hudson is offering FREE cleanup supplies and It's in the Bag reusable cleanup bags while supplies last. Download the flyer and follow the instructions. 1/11/2018 Artist Awards. Six artists submitted beautiful designs to decorate our reusable bags and hang tags. 170 local leaders voted and the awards went to Lauren LaForce and Sarah Bohnenstiehl. Stay tuned here for news from the field about creative campaigns, what people are picking up, where they are picking up and more. DropBox Link to Share Videos and Photos.